Here are some past class projects. The tea tin uses the So Many Scallops set and Cutie Pie DSP. 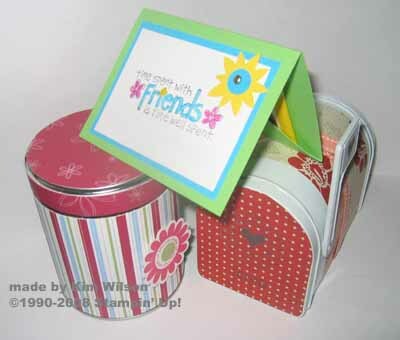 The mailbox tin uses Ginger Blossoms DSP and The free SAB Rub-ons set on the flag and lid. The card on top is a Tea Bag holder using the hostess set Time Well Spent.